You don’t even have to splurge to make it to the tropical paradise. 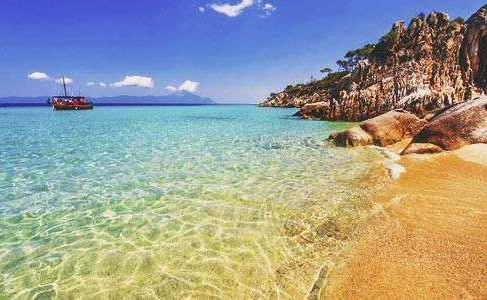 Most European beach destinations are easy on the pocket, and many beach resorts offer exclusive discounts and packages for a stag do. There are many reasons why you must take your stag party to an exotic European beach. While UK has it’s charm, heading to a European beach city for a stag weekend promises so many possibilities for you and the lads to have fun. After all, who doesn’t love to chug a cold beer under bright sunshine with nothing but an endless horizon of blue stretched before the eyes! Cities like Ibiza, Prague, Sardinia and Barcelona have some of the most exciting beaches where you can indulge in water sports to get your adrenaline pumping. You could hop on jet skis and race the groomsmen, dive deeper for snorkelling or stay on dry land racing on beach buggies. The nightclubs in many of these beach destinations stay open through the night. Yes! You heard that right. You could party and dance the night away until you can’t anymore. No curfews. Barcelona, Ios and Prague are among the cities that have the best nightlife in the world with no closing hours. The clubs blare with the tunes of some of the finest DJs that reel in the best crowd. There is nothing you and your lads would want more than to party like there is no tomorrow. If you thought you splurged on travelling abroad, you get to save money on alcohol! Being the ultimate party destinations, it comes as no surprise that the liquor in these exotic beach locales is light on your pocket. Budapest, Berlin, Lagos and Barcelona have it going as cheap as €1 shots. A major pro of spending you wild stag weekend abroad is you get to celebrate with your groomsmen without running into anyone you know. So, you can party anyway you want to- charter a boat and ride across the blue waters, relax and unwind at the beach club, throw a yacht party or have a men’s night at a strip joint and take comfort in knowing anything you do on your stag do will never get out. But make sure you don’t get so outrageous that you end up running a trouble with the law in a foreign land. Not only will that be a bummer, but it may jeopardize your wedding. The exotic European beach cities offer many activities for your stag party that you can’t do in the UK. Pub crawling through the night, jumping off a cliff onto the ocean below with your lads, parasailing over the vast expanse of blue, mingling with interesting locals or women for your single friends and basking under the bright sun while seated on cushioned lounge chair and sipping your drinks with absolutely no care in the world. Isn’t this what a stag do is all about! If you want to impress the groom and other groomsmen, make a plan, set a budget and head to one of the many exotic European beach towns to celebrate your friendship and the groom-to-be’s bachelorhood, and give the him an ultimate see-off into his marital world. All you need to do is get in touch with the experts at www.stagweekends.com, and we’ll put together the best weekend of your lives!